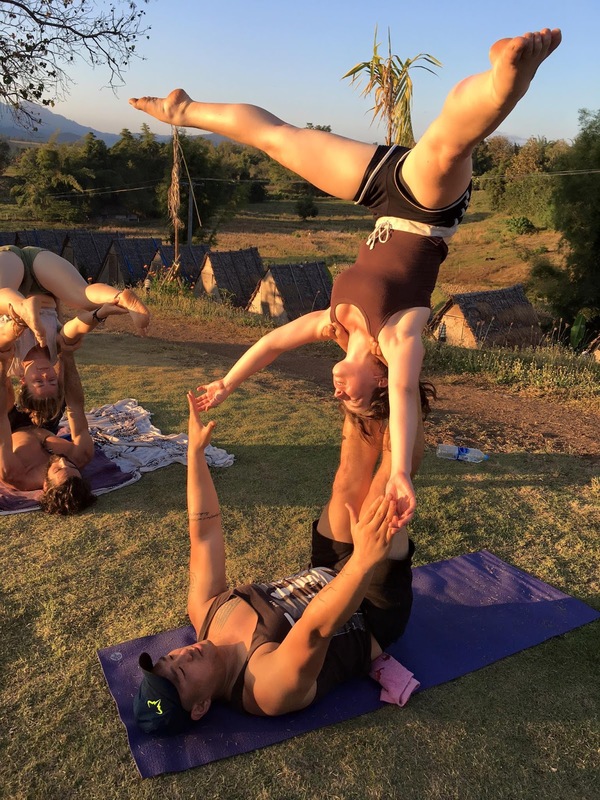 AcroYoga in Thailand: My New Favorite Sport! I recently discovered my new favorite hobby. It's something I've briefly heard of and maybe even seen photos of but never thought I'd be interested or able to do it. But that's the beauty of living in Thailand, having the freedom to explore new hobbies because of the amount of free time we have, the variety of people from around the world we meet, as well as the low cost of living giving us financial independence. 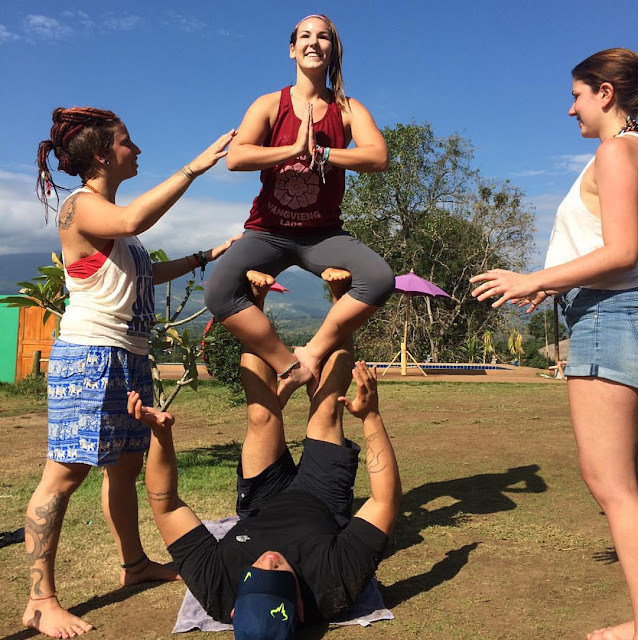 AcroYoga combines core strength, flexibility, balance and is a great way to meet cool people who are into health and wellness. It looks super intimidating to start, but trust me, if I can do it, anyone can and here's why, where and how to start. This post has been updated for 2017! It's crazy that it's been almost two years since I first started doing Acroyoga and that I still enjoy it just as much. It's one of those sports I can see myself doing for a lifetime as the basics take a long time to master and the advanced possibilities are endless. The best thing is the fact that I've been able to find Acroyoga jams in every country I've been to so far including Thailand, Bali and even Ukraine! Last weekend, I went to a Juggling Convention at the Pai Circus School just a few hours north of Chiang Mai. I went with the intention to learn some more juggling tricks, just for fun, but ended up trying Acro for my first time and fell in love with it instantly. My first experience was "flying" which was being on top and it was out of this world awesome. The guy on the bottom, known as the base, was Eric Broe who I had just met but was kind enough to show me a few tricks that would change my life. I think it was because of how safe and comfortable he made me feel that I wanted to give back and give others that same first experience as he had shown me. These photos are from my first ever flying experience, doing things I never thought possible for my heavy build. Backbend on the left and Bat on the right. I've always known the benefits of Yoga but honestly found it kind of boring. I know the benefits of flexibility and mobility, and after tearing my calf muscle earlier last month I know how vital it is to focus on. However, the with most Yoga people focus purely on flexibility and not enough on strength. 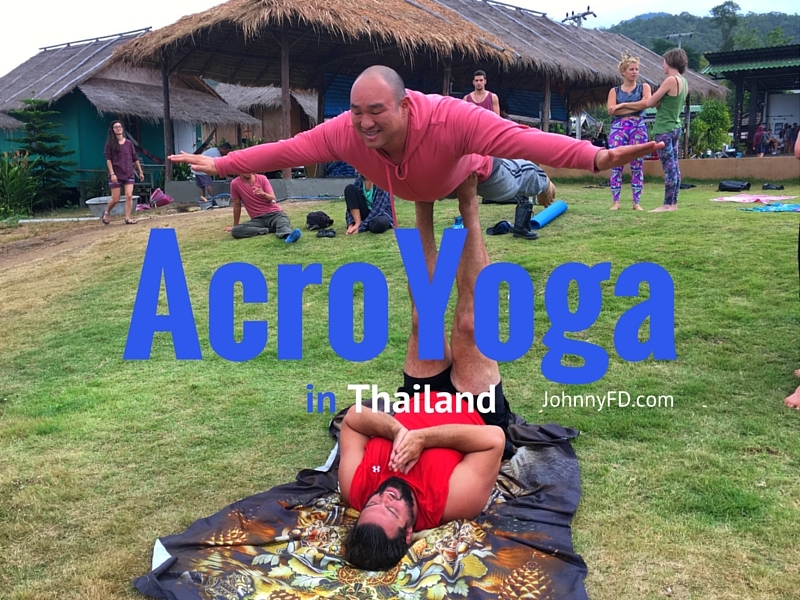 AcroYoga perfectly combines the two aspects, and it's fun. I discovered it last thursday and have done it 7 days in a row since and plan on making a big part of my life from now on. It's also a great way to build trust, understand your body, and is a fun partner activity as well as a great way to meet new people. I'm still a beginner but have already learned a bunch of cool tricks that I can't wait to practice. My goal is to get more flexible while building both core and body weight strength while learning a fun skill that I can do around the world with zero equipment besides maybe a Yoga mat. Here I am as the Base for my first time doing Star. If you're in Chiang Mai, just join the AcroYoga Chiang Mai facebook group and see who's going to be at the park that day. But most of the time you can just show up as there have been people doing it there after 3:30pm everyday I've went by Buak Park. For any other city in the world, just google your city name and AcroYoga and you'll be able to find something as it's growing in popularity quickly. Or you can see who's around you by using AcroMaps. Basing the Acro-Yoga position called "Throne"
As cool as the photos and video are, the experience is something hard to describe. So do both of us a favor and go for a class or meetup somewhere. Especially when using a spotter, which you should do as a beginner anyway, Acro is actually really safe and a lot easier than it looks. If you want a full list of all of the cool Acro poses check out Acropedia. Let me know how it goes for you. Flexibility and mobility are two things that we don't realize are important and put off until we actually injure ourselves. My calf muscle tear could have been 6 months of rehab but I got super lucky and got a wake up call. If you can't use a squat toilet comfortably chances are you'll have a preventable injury in your 30's or 40's. So take my advice and start focusing on your health and body now. 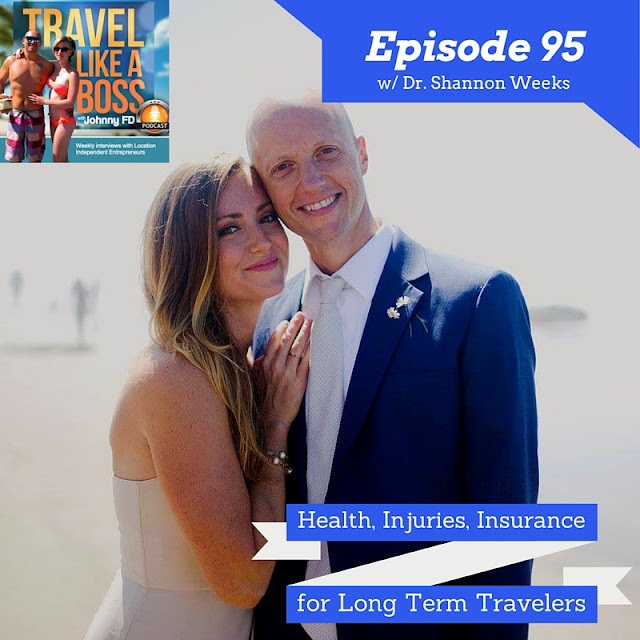 Here's an interview I did with Dr. Shannon Weeks, the guy who repaired my calf muscle about the importance of preventing injuries. Thanks Eric for linking me to this great video. Any path to yoga is a good path! Looks like a fun time!